For anyone who’s grown up in India, the topography of the squat Ambassador car is as familiar as the lap of a beloved old grandma. After all, for decades and decades, it was the way modern India got around, and was the ultimate dream of every burgeoning middle class household. 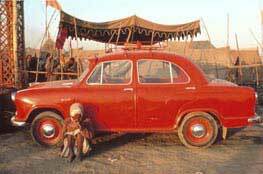 Yes, a lot of life in India has been lived in the Ambassador; it’s almost a part of the family. It was private car and taxi, pride and possession. The seats were tough, the handles hard, but oh, the places it could take you! First manufactured by Hindustan Motors in 1957, the boxy exterior of the Ambassador still echoes the shape of the 1950’s British Morris sedan. As family car and political vehicle, air-conditioned limousine and rattling taxi, it’s been a silent (sometimes noisy) part of contemporary India, a ubiquitous presence at weddings and funerals, on city streets and in the bazaar. And it got its share of ridicule. But now, the Ambassador is getting some respect! It’s the star attraction at an exhibition at the Sackler Gallery of the prestigious Smithsonian Museum. And who better to document the Ambassador for posterity than the late great photographer Raghubir Singh? The Ambassador is the star of Singh’s last big project before his death in 1999 and the result is A Way into India (Phaidon), a wonderful book of images shot by him across India. In Auto*Focus, the Sackler Gallery (through August 10) not only shows 48 of these vivid images, but actually gives visitors a chance to sit in an Ambassador and watch footage of the ‘Amby’ and Bollywood film clips. You don’t need ten songs, dozens of costume changes and scores of foreign locales to tell a beautiful love story. From noted actress and director Aparna Sen comes Mr. and Mrs. Iyer – a poignant, lyrical film about romance amongst the ruins, in the middle of riots. Sen, who has directed memorable films like Sati, Paroma, Picnic and Yugant, made her directorial debut with an English language film, 36 Chowringhee Lane, winner of the Grand Prix at the Manila International Film Festival and the National Award for the Best Direction in India. With Mr. and Mrs. Iyer she shows that she has not lost her deft touch. The story is about how ordinary lives intersect and how even a chance encounter can transform a life. Meenakshi Iyer, born and brought up in an orthodox Brahmin family, is traveling alone with her infant son, returning to her husband after a visit to her parents. On the bus, she encounters Raja Chowdhary, a wildlife photographer. The calm and tedium of the journey is broken by an angry mob of Hindu extremists, seeking to avenge the burning of a Hindu village, are out on a rampage, looking for Muslims. Raja is a Muslim. Hardly knowing him, Meenakshi impulsively saves him from the mob by pretending that they are a married Hindu couple, Mr. and Mrs. Iyer. The film follows their slow transformation, as they have to rethink and re-evaluate their prejudices and their entrenched beliefs. And somewhere along the way, as they complete the journey, love blooms. Mr. and Mrs. Iyer, which won two awards at the Locarno Film Festival in Switzerland, was shown at the South Asia Human Rights Film Festival at the Asia Society in New York. The film has remarkable, nuanced performances from Rahul Bose and Konkona Sensharma, who is Sen’s daughter, in the lead roles. And the wonderful music by Zakir Hussain makes every frame come alive, etched in the memory. “I wanted to make a very simple film, without any cinematic gimmickry, about a man and a woman from two different religious communities, who fall in love despite religious differences,” says Aparna Sen.